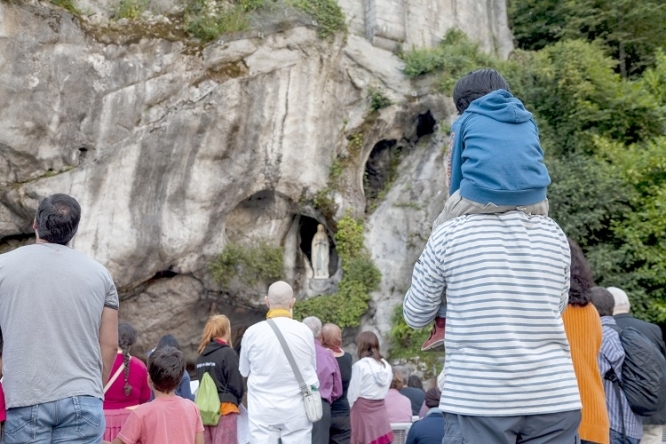 Lourdes is uplifting, other-worldly and spiritual. It is also tacky, vulgar, and crammed with coach tours. In 1858, it was a small agricultural market town in the Pyrenean foothills with a population of around 4,000 people. One of them, a 14 year-old called Bernadette Soubirous, formed the habit of praying in a shallow grotto beside the Gave de Pau river which ran past the town. It was an insalubrious place, where rubbish was dumped, firewood collected and animals grazed. There, in a niche just above the grotto, Bernadette saw an apparition of the Virgin Mary 18 times over a few weeks. The apparition told Bernadette to “Go and drink from the spring”, “Go and tell the priests to build a chapel here,” and “Have the people come here in procession”. And where Bernadette touched the ground, water sprang up. Little by little people heard about the apparitions and began visiting the grotto. Over the years Bernadette received more and more requests to talk about her experiences, until finally age 22 she became a nun. (She died at the age of 35.) But her legacy was fixed. Her visions validated by the Catholic church, the spot was venerated as a pilgrimage destination. Around 200 million people have visited the site since 1860 and every year up to 6 million more people arrive. 350,000 of them bathe in the water, many hoping for a miracle. The permanent population of Lourdes is 15,000 but the town boasts 270 hotels with a total of around 11,000 rooms. Paris is the only French city with more hotel rooms than Lourdes. The 124-acre area around the grotto is called the ‘Sanctuary’ and contains 22 different places of worship along with a medical centre, administration blocks, a library and several impressive cathedrals. The original Crypt has been joined by the Upper Basilica, the Rosary Basilica and the controversial Underground Basilica: constructed in 1958 for the centenary of the apparitions, the brutal 50s concrete bunker can accommodate a mind-boggling 25,000 worshippers. There is also the Church of St Bernadette constructed in 1988 on the riverbank opposite the grotto; St Joseph’s Chapel; and the Chapel of Reconciliation where priests are available to hear confessions in almost any European language at any time.